'The Broom Cupboard of the Emily Davison Lodge' served as a way of displaying footage of a performance to camera I had made in 2013 to mark the centenary of Emily Davison's fatal Epsom Derby protest. This interested me because of the exemplary creative nature of the plan (to pin suffragette colours on the king's horse and have that captured by the press) and because historical narrative has covered this aspect over and instead presented Davison as a monstrous zealot. For my commemoration, I gained permission from Black Rod to film myself reading out the suffragette's unpublished manifesto 'The Price of Liberty' in a broom cupboard in the Houses of Parliament where she had hidden to evade the 1911 census. In order to disrupt historical narratives of history, my installation also incorporated artistic renditions of archival material linked to the original Emily Davison Lodge (founded in 1913) juxtaposed with politically invested art works made by myself in the Lodge's name. This artwork sought to re-contemporise the tactics of the militant suffragettes, playing with historical aesthetics to express contemporary political concerns whilst underscoring the value of individual acts of emancipation (as part of the piece, a small plaque publicised Friedrich Nietzsche's quotation: "One must give value to their existence by behaving as if one's very existence were a work of art"). 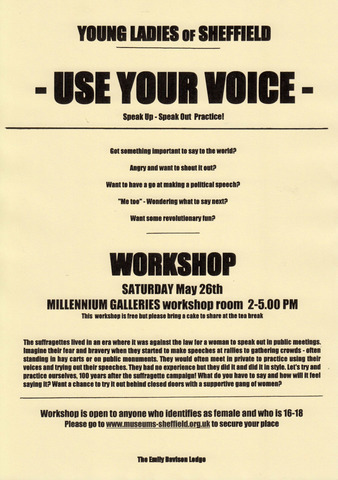 Most importantly, the art work functioned as a vehicle for activism outside the gallery: Flyers advertising a free work shop "Young Ladies of Sheffield - Use Your Voice!" were made available to visitors via a leaflet dispenser on the broom cupboard wall. The workshop was lead by myself and fine art student, Rachel Templeton. The exhibition 'Hope is Strong,' curated by Louisa Briggs, aimed to explore, "the power of art to question the world we live in" and featured prominent artists working in the field of art and protest such as Ai Weiwei and Jeremy Deller.